Provides state-of-the-art coverage for the researcher confronted with designing and executing a simulation study using continuous multivariate distributions. Concise writing style makes the book accessible to a wide audience. Well-known multivariate distributions are described, emphasizing a few representative cases from each distribution. Coverage includes Pearson Types II and VII elliptically contoured distributions, Khintchine distributions, and the unifying class for the Burr, Pareto, and logistic distributions. Extensively illustrated--the figures are unique, attractive, and reveal very nicely what distributions ``look like.'' Contains an extensive and up-to-date bibliography culled from journals in statistics, operations research, mathematics, and computer science. 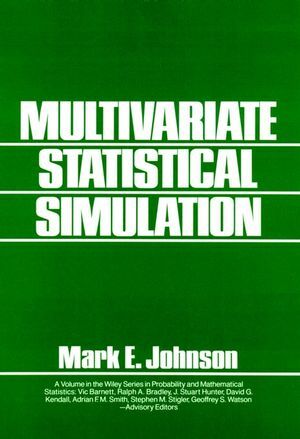 Mark E. Johnson is the author of Multivariate Statistical Simulation: A Guide to Selecting and Generating Continuous Multivariate Distributions, published by Wiley. Univariate Distributions and Their Generation. Multivariate Normal and Related Distributions. Circular, Spherical and Related Distributions.